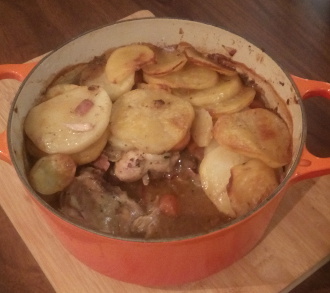 This recipe is a perfect recipe if you are a fan of one pot cooking. It is really delicious, has a fantastic gravy and never fails to please. You can substitute the stout for regular beer or chicken stock but believe me, the stout gives it a really great flavour. For my foreign readers, a stout beer is very similar to Guinness. Serve it with some creamed spinach or any greens. Green beans in a bit of garlic with bacon are excellent with this dish. This will serve 4-5 people quite happily. If you have more than 5 people just add other vegetables to serve it with like broccoli and cauliflower steamed and smothered in cheese sauce. 1 tablespoon of chopped Fresh herbs + bay leaf (thyme, rosemary, celery leaf or whatever you have in the garden/fridge) or, if you have a bouquet garni, toss that in. Chop up all of your ingredients and take a 23-30cm diameter casserole dish that is nice and deep (over 10cm) or cast iron pot and place a layer of potato slices in the bottom. Now place a layer of chicken pieces and half of all of the rest of the ingredients, another layer of chicken pieces and the rest of the chopped ingredients and brown onion soup. Now pour the melted butter over the potatoes, cover with a lid and put into a 160 celsius oven for 90 minutes. Remove the lid, turn on the grill and grill the top until the potatoes look fabulous and brown. Let it stand for about 10 minutes before serving if you can.